Starting GPS Co-ordinates: N51 07' 10" W000 93' 00"
Finishing GPS Co-ordinates: N51 07' 30" W000 93' 60"
UPDATE 10/05/2014: This byway is apparently completely blocked at its southern end by a fallen tree. 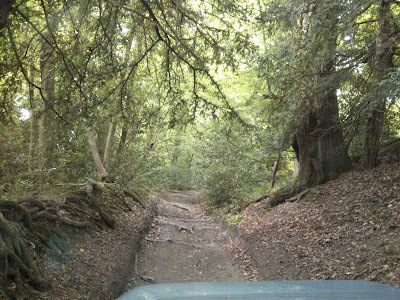 The rest of the green lane is apparently also rather overgrown. Best to avoid this byway until a clearance programme has been completed. This unnamed byway (which we, in the absence of any evidence, have called Brook Lane after the cottage to the north of the green lane) is very short it has obviously seen very little recent usage as it is becoming rather overgrown. The foliage protruding from the hedgerows that line this green lane makes it relatively tight in places and scratches on paintwork are guaranteed. Starting at its southern end on Milk Lane (just south-west of the pretty village of Empshot) the byway leaves the country lane on a north-westerly track. It is initially a steep climb up from Mill Lane, and although the earthen surface of the byway is solid enough it is also covered with the roots of mature trees, the negotiation of which makes progress slower and much bumpier than it otherwise would be. Once the roots are passed, however, the byway levels out and plunges into the aforementioned briar and little else can be said of it until it's welcome ending in the hamlet of Empshott Green. Not really worth a visit. To Hampshire County Council this is Hawkley Byway 4. This lane is completely blocked at the southern end by a massive fallen tree. I approached from the North and met the obstruction, as it is so tight there is no places to turn around, leaving me to reverse all the way back up the lane, the North entrance foliage needs some attention as it is a tad overgrown. Thanks for the update: information such as this is invaluable in helping us to keep this site relevant. Give yourself a pat on the back!